Food as art. This is what I see when I look at this gorgeous tart. Colors, textures, pattern. I never in a million years thought I could manage this recipe, but I tell you in all honesty, it was simple. Using my hands to make those lovely circles was very satisfying. A true creation. The recipe comes directly from the fantastic blog, InVegetables We Trust and you can find the original recipe here. I made a few changes including making it larger than the original. I also used a Pillsbury Brand crust, which is made with lard, so unfortunately, I can’t include this in the VeganMoFo. Speaking of which, anyone out there want to join me in the Vegan Month of Food? You don’t have to be a blogger or even a vegan, just a lover of great food. See what it’s all about here. Prebake the pie crust at 400 degrees for 10 minutes. Be sure to prick the crust so it doesn’t bubble up while baking. I used a 10 inch tart pan, but the original recipe calls for an 8 inch pie plate. Basically, the bigger the pan, the more zucchinis you will need. Meanwhile, slice the zucchini lengthwise as thinly as possible – I used my mandolin, so there was a little bit was waste cuz there’s no way on earth I’m getting close to the killer blade on the mandolin. 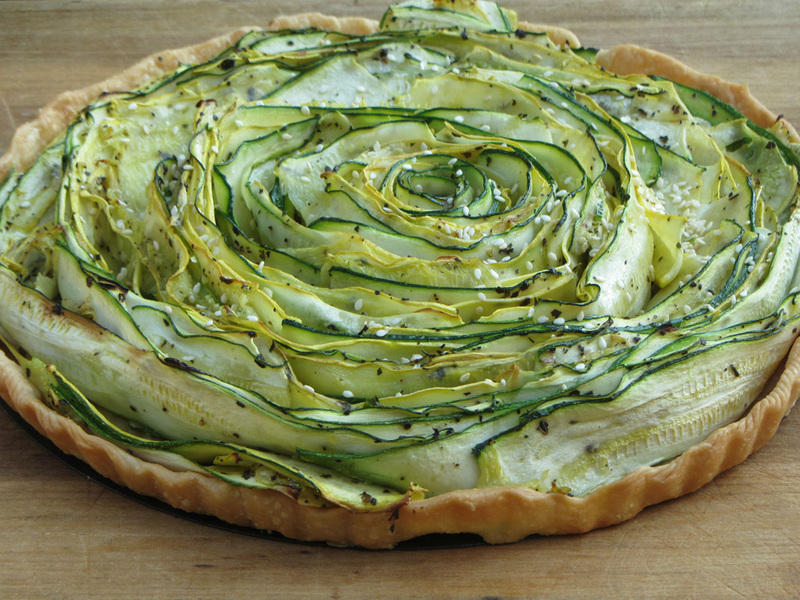 Drizzle the slices with olive oil and liberally season with pepper and basil. Roll the veg up in circles, adding on to where you left off. Surprisingly, they all just kinda stuck together because of the oil. Keep going until you have enough to fill your prebaked pie shell. I actually recommend using a tape measure or ruler to measure the diameter of the crust. Carefully place the circle of veggies in the crust and use a fork to arrange them in a pleasing way. I had to flatten the layers of zucchini a bit in order to actually fill my crust. Bake for about 30 minutes, checking every 10 minutes. Sprinkle with sesame seeds and course sea salt. Important!! Cool a bit before cutting. Use a serrated knife. Gently hold the tart with your hand while cutting. I am an empty-nester and I’m not sure what that means. No more wet towels on the bathroom floor? Fewer trips to the grocery store? Yet another change in the way we eat? Certainly fewer cars in the driveway. Certainly more afternoon walks. Certainly more time creating care packages. Will that pile in the basement go away? And what about late night bonfires? Who will ask me to do stuff? Certainly fewer laughs and funny stories. I am taking it in stride: looking to my future. I am relying on myself. I am remembering long years of laughter and tears and worry. I feel satisfied and melancholic. 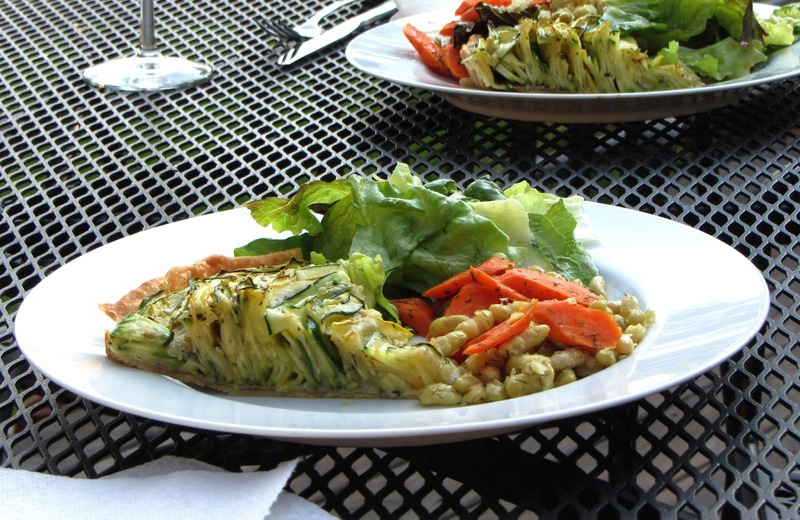 Anyone out there interested in participating in the Vegan Month of Food 2013? (VeganMoFo) The fun starts in September. You can see my VeganMoFo2012 posts by clicking here. I keep dreaming of having a vegan dinner party. You may recall that I almost pulled it off for a party on St. Patrick’s Day, but I gave in to fear and served the classic Irish menu: Corned Beef. Don’t get me wrong, it was great and my guests were pleased, but I think I’m ready to ‘go public’ with my new vegan diet and host a vegan dinner party. I admit, I am not 100% vegan, but I am doing pretty well, all things considered. I understand a true vegan gives up much more than animal foods. They give up wearing and using leather. They give up cosmetics and other products that are tested on animals. They are probably active in the animal rights movement. They lead a very compassionate life, actually. Me, I just wanted to lower my cholesterol and made the decision to try vegan meals for one month last October. I guess it stuck, cuz here I am staring my one year anniversary in the face. The recipe can be found here. I followed it to the letter. These little croquettes were absolutely fantastic! A tiny bit smoky from the chipotle. A tiny bit sweet from the potato. The hint of lime was perfect. And the pumpkin seed cream was heavenly! How would you feel if you came to a dinner party and saw this on your plate? Becoming vegetarian/almost vegan has come naturally to me – I guess because I love food and I love to cook and I love to experiment in the kitchen. Using new foods and flavors was not really that difficult for me. I can understand, however, why people might think it’s radical to have so many beans and grains in the pantry, and not one slice of cheese in the fridge. Some might comment that new foods are strange or unappetizing, but I think that’s just because they haven’t attempted to incorporate them into their diets. Tofu is an example of one of these foods I am talking about. It’s still pretty new to me, but I no longer FEAR tofu!! I actually EAT it !! And this is where the idea of a learning curve comes in. Remember learning how to cook a boneless, skinless chicken breast…. how to keep it juicy and tender….. how to create the various sauces and flavors to overcome the ‘sameness’ of the meat? Remember all the dry, unforgiving chewy chicken early in your cooking career? Well, it’s kinda the same when using any new food, like tofu. There is a learning curve. Some failures at first, true, but then you get the hang of it. I will publicly admit that only a year ago, I had no idea what tofu even was! Talk about growth and learning! I now not only know what it is, I understand the different types of tofu and I’m even starting to use them in my weekly menus. Come on, try a new food. Don’t be put off by the thought of failure. Just remember the early days of the boneless skinless chicken breast staring you in the eye and the dread of creating something appetizing from that dull piece of meat. If you can conquer that, you can conquer anything. The weather is pretty cool up here in Michigan today, but it's never too cool for ice cream. This one is fantastic! Blend in high speed blender until smooth. Chill for at least 3 hours. Freeze in an ice cream maker according to the manufacturer’s directions.